Today was, thankfully, rather quiet at work.Â As the project manager, I have to be on hand pretty much all the time to answer questions etc., but if I’m caught up on task management and people aren’t asking too many questions, I can nip out and do other stuff, assuming I stay near the computer. I like the single breasted version better – it doesn’t distract from my face and it makes me look slimmer. It looks like it’s tight across the shoulders at the back of the neck, and there’s something funky going on at the waist.Â I’m going to have to track that down via my handy-dandy books on fit and adjusting patterns. I’m not sure how I feel about the flare.Â It’s definitely dramatic, but I can’t help wondering whether a straighter pattern wouldn’t be more slimming, especially with the vertical lines in the fabric.Â I may try redoing the seams to eliminate the flare and seeing how it looks. I’m rapidly reaching the point where I will have to stop sewing and start packingÂ for the move, but I’m enjoying this process so far.Â And it is definitely a great antidote to work stress. It is really cool how you can compare the two muslins and see what parts of your body they emphasize. It’s surprising that relatively subtle differences in pattern can make a big difference in emphasis. I wonder what the difference will be with your gorgeous fabric instead of the white muslin. I wonder if you could photoshop those pictures somehow – so you could stick your fabric on the photo in place of the muslin? (I’m not a photoshop expert….or even able to do anything with it…..but I bet you know some one who is….doing the sort of work that you do!) Just a thought. Anyway, you are making amazing progress….while working crazy hours and getting ready to move. Sheesh!!! I get stressed just thinking about it! You are going to have a fabulous coat at the end of this project! So inspiring!!! Keep up the great work!! Hmm… Not that it’s for me, but I’m not terribly fond of either shape, although the single-breasted one is definitely better. Both seem to be trying to make the person underneath appear broader… but your build already does that without assistance. Perhaps if you could put the shoulders from the double-breasted version onto the single-breasted one. I think the “funky” feel from the back of the single-breasted one probably starts with it being off center. I don’t think the seam line is following your own centerline. I wish I had time to do more projects. I haven’t sewed anything in ages. 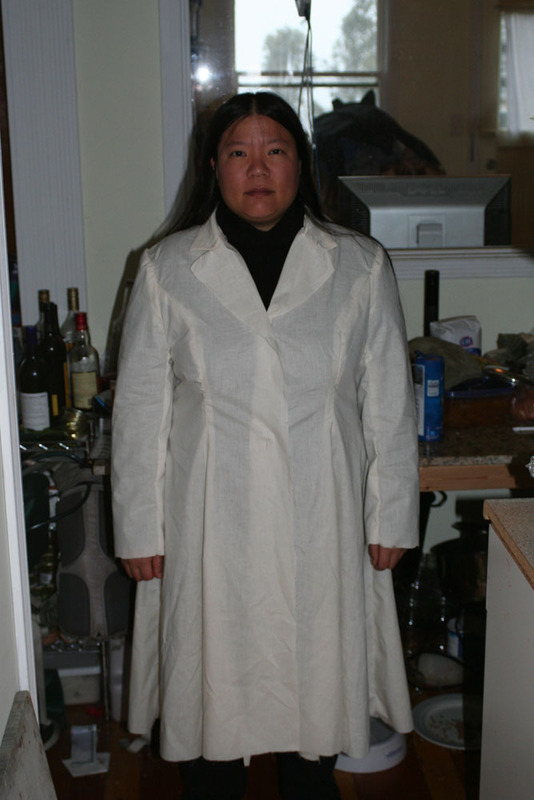 Perhaps a waist to shoulder cut would look better on you than the princess cut that the coat muslins have. It would make the vertical line longer and add less to your shoulders. 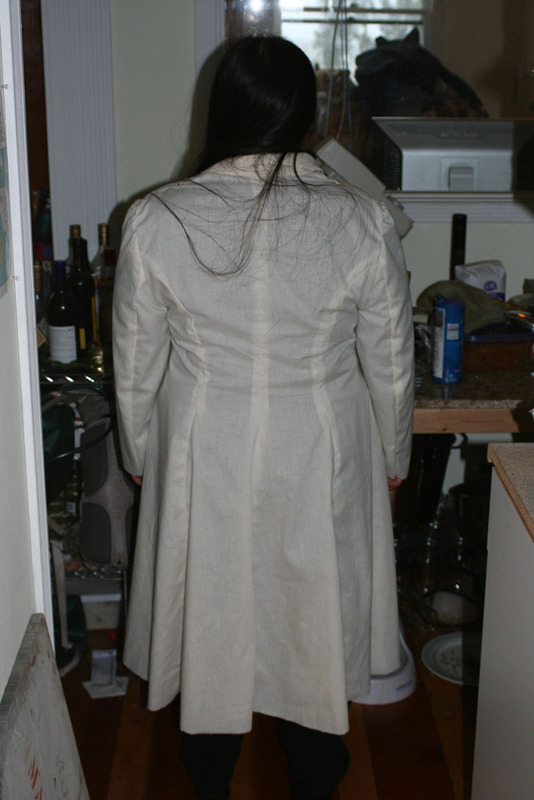 In the photo I think the back shoulder area looks fine and the creases at the waist could be because you need a little bit more with at the waist/hip. If the coat can’t hang away from your hip, it will wrinkle. Removing some of the flare seems like a good idea to me. That’s just what I thought when I saw the photos, can’t resist trying to come up with a solution to cut/fit problems. It’s going to be so exciting to see what it’ll look like in your fabric! First, have you got the shoulder pads in if you are going to use them? They will definitely affect the look of the coat. Those wide lapels really emphasize the width, despite the elongating effect of the deep V. Do you want that? You are right about the flare. Less flare would be more attractive. The wrinkles across the back mean that it is too tight there. There are similar but less deep wrinkles across the same spot in the front. Princess styles can be very flattering but they need to just skim the body. I think if you loosen up the seams at the waist and upper abdomen, the slant in the back seam will straighten up. Is the sleeve a 2-piece sleeve? 2-piece sleeves are better than 1-piece because they follow the shape of the arm. Thus they are also more comfortable to wear. Although you have your heart set on the princess/flared coat design, perhaps a coat pattern that is cut more or less straight from the shoulder would be more in keeping with the strong vertical lines in the fabric. It would require less refinement in fitting. You could still use the black suede (or Ultrasuede) for a collar, trim, and buttons. You could create a psuedo-princess look by running a seam from the mid-shoulder down to the hem, but it would be nearly vertical. The back could be three panels–a wide panel in the center and half panels on the sides. I agree, the single breasted coat is the better choice. 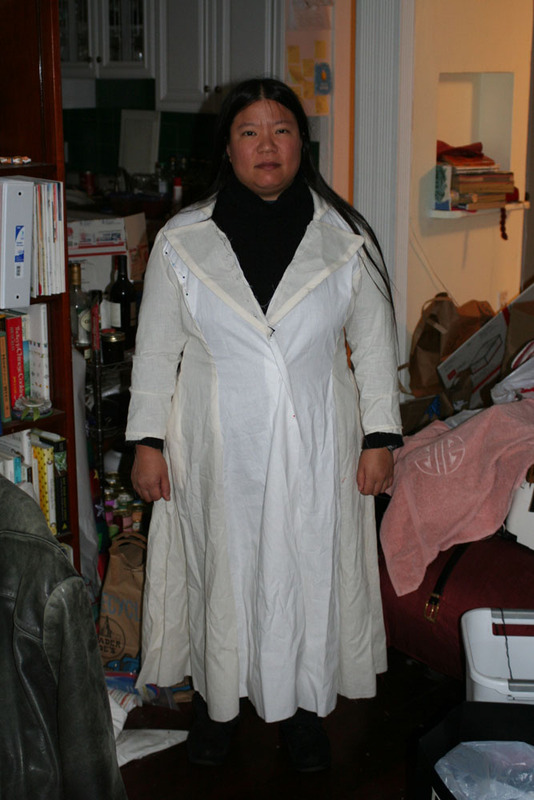 The curved princess seams will look wonderful with the fabric weave, but it looks like you need to have much less curve to allow for body shape and clothing under the coat. I find this with Vogue patterns, they need a lot of adjusting for me, not just in bust size, but also in waist location.